German cities like Muenster and Freiburg have developed some of the world's best bike infrastructure. Dr. Ralph Buehler spoke about lessons that D.C. can take from Germany last night at the Goethe-Institut. Yesterday I attended “Biking, Walking, and Public Transport: Smart Mobility for the 21st Century” at the Goethe-Institut. The event kicked off with a great hands-on demonstration of how to change a bike tire by Daniel Hoagland, D.C.’s star bike ambassador. 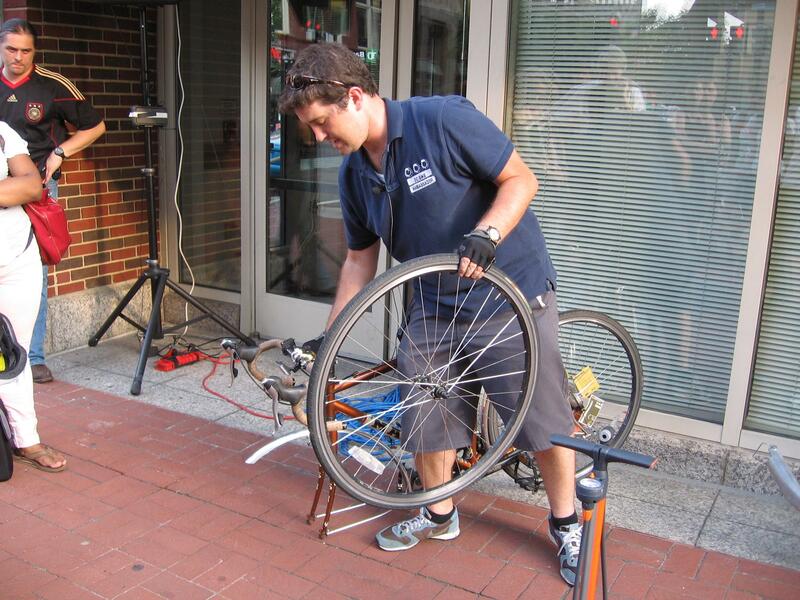 D.C. Bike Ambassador Daniel Hoagland demonstrates how to change a bike tire. Photo via Sylvia Blume. Some highlights: If you have a flat tire, and you don’t know where the hole is, fill the inner tube with a little air and squeeze it until you hear where the air is coming out. If you can’t find the hole this way, try submerging the tube in water and looking for bubbles. Still can’t find a hole? You may just have to replace the tire. Also, make sure to invest in a good pump with a gauge (should cost around $30), and a patch kit – which will set you back $5 or $10, at most! A worthwhile investment since it will save your day any day now. After the demonstration, Ulrich Braess, Director of Goethe-Institut, introduced the event, speaking about his personal experience using Barcelona’s bike share system. Braess said biking to and from work every day on Bicing bikes shaved at least 15 – 30 minutes off his commute, sparing him from the sticky air on the metro and allowing him to coast by congestion on the streets. Bike sharing, then, led to an immeasurable improvement in quality of life – an improvement we hope is in store for many Washingtonians with Capital Bikeshare. Dr. Ralph Buehler and David Alpert (GreaterGreaterWashington) gave fantastic presentations on what Washington is, can, or should be doing to promote “green” modes of transportation: walking, biking, and public transit. Buehler focused on Germany’s experience over the past thirty years, noting similarities between Germany and the United States – including federal systems of government with lots of power at local level, important auto industries, highest levels of car ownership in the world and extensive road networks – to make the case for comparisons. From 1995 to 2005, while CO2 emissions in the United States rose by 2 percent, emissions in Germany fell by 7 percent. Why? Well, people walk and bike more in Germany. Partly because gas is about twice as expensive with Germany’s gas tax, and German infrastructure and driver training makes cycling and walking much safer than in the United States. Most residential areas in German cities have traffic calming and home zones where speed limits sometimes drop to 7 kilometers per hour. 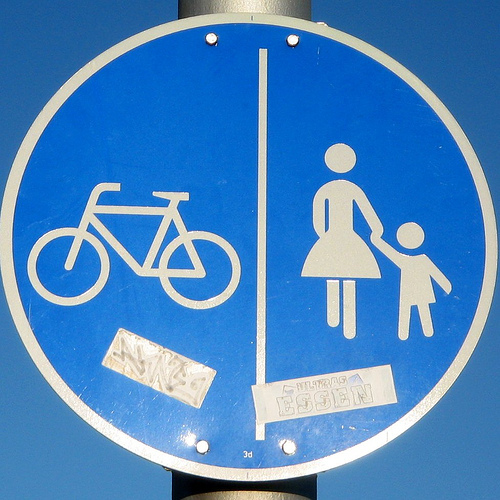 Schoolchildren in Germany have bike training and pass a police bicycling test around the age of ten. And drivers fail their driving test if they do not yield to bikes when appropriate and show heightened awareness when bikes and pedestrians might be around (Buehler failed his first driving test because of this!) Small changes such as making driving tests more stringent could make a big difference in the D.C. area. Buehler also used examples of transit-oriented development from Freiburg, which clustered development around its light rail over the past forty years, and also offers a great RegioMobilCard for 50.50 € per month for the Freiburg region; the card gives unlimited trips on public transit with free rides for a companion at off-peak hours. The system has regional coordination of services, timetables, tickets and finances – which allows for a single fare and seamless transfers across operators and public modes in the regional system. Something like this would be wonderful for Washington, but still feels far away. Metro could start by bringing back the monthly pass. Bike and pedestrian infrastructure in Freiburg, Germany is some of the world's most advanced. Photo via Tillwe. Speaking of citizen involvement, David Alpert’s GreaterGreater Washington has proved an excellent tool to organize people in support of the transportation improvements they favor most for Washington. Alpert highlighted some steps being taken in D.C. to make transit more sustainable. These include the proposed K Street transitway (see here and here), the proposed 37-mile streetcar network, and the temporary curb extensions at the “death star” intersection of Florida, W Street, New Hampshire, and 15th Street. The temporary curb extensions are a great example of something temporary and cheap that DDOT can do to improve safety; hopefully, with the help of SeeClickFix, other intersections can get attention before people are killed trying to walk or bike through them. 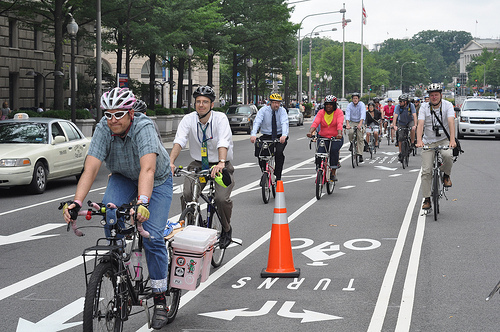 D.C. officials celebrated the opening of new bike lanes on Pennsylvania Avenue this week. The lanes would be safer if they were painted green and physically separated along the entire route. Photo via Transportation for America. Alpert also pointed to the Pennsylvania Avenue bike lanes and 15th Street bike lanes as recent improvements – which, of course, can still be improved upon. Some of the obstacles to further improvements in sustainable mobility in Washington include some well-organized lobbies like the Committee of 100, the Alliance for Rational Development, and the Cleveland Park Citizens Association. 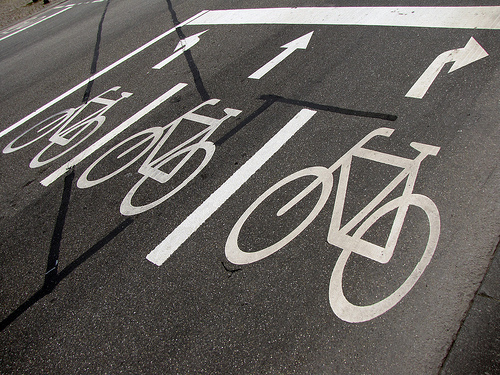 Federal agencies also make progress difficult on some issues difficult (for instance, the National Park Service doesn’t want Capital Bikeshare at monuments, and the U.S. Commission of Fine Arts doesn’t want the Pennsylvania Avenue bike lanes painted green – which would help keep drivers out of them). But, blogs are helping sustainable transport advocates organize and lobby, too. And they’re helping to change how we view the city: they inspire, inform, organize, coordinate, and critique, according to Alpert. With the high number of people relocating to D.C., there’s an increasing interest among new residents to make the city more livable. Optimistically these citizens can organize more and more, and help Washington D.C. overcome larger, societal obstacles to better sustainable transport and regional integration. These include a U.S. political bias for rural areas and the founding precept that Washington D.C. would remain a seat of government, rather than a large urban area. Tags: bike lanes, biking, cycling, Goethe-Institut, Integrated Transport, pedestrian planning, pedestrians, WABA, walking, Washington, D.C.